London 1737 - Botanical print. Copper engraving with hand coloring. Plate 213. Page measures 13 1/2" x 8 1/2" Botanical print. Copper engraving with hand coloring. Plate 213. Page measures 13 1/2" x 8 1/2". 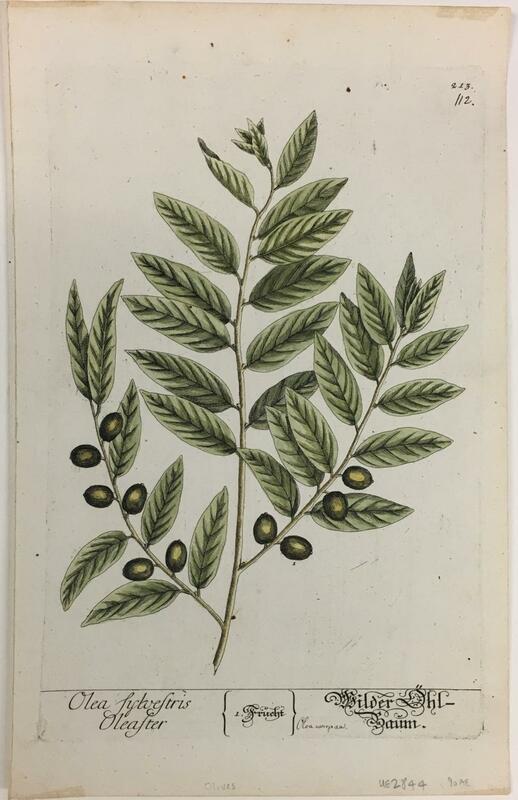 Richly colored illustration of an olive tree published in "A Curious Herbal" which depicts exotic plants from the New World used for medicinal purposes. Elizabeth Blackwell (1707-1758) was trained as an artist but untrained in botany. She collaborated with her botanist husband while he was in debtor's prison and with the curator of the Chelsea Physick Garden where the plants were under cultivation. She engraved the copper printing plates for the 500 images and also hand-colored the illustrations. The financial success of the book led to her husband's release from prison. For more Blackwell prints, please see our gallery.